Spring is here, the sky is blue, and amazing Android and iOS apps are blossoming left and right. We’ve picked top 10 best new and updated apps and games for the month of April to help you keep your phone as fresh as spring air. The MOBA gender still has plenty to give, and Fhacktions demonstrates this perfectly. To win this location-based MOBA game, you must conquer servers in real-world locations to gain power and currency. To accomplish this, you can team up with friends and form powerful factions, improve your strategy and teamwork, and level up various characters, each offering a different set of skills and abilities. Fhacktions is still a relatively unknown MOBA game, giving you a head start if you register early and master the game’s mechanics before everyone else does. 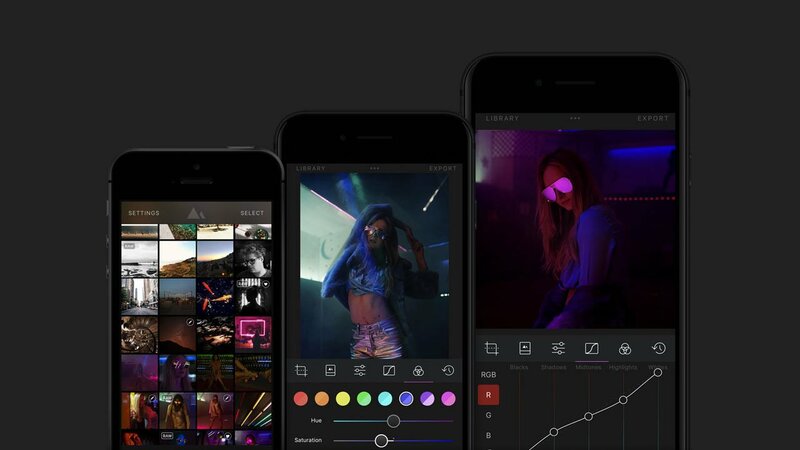 Darkroom is a powerful photo-editing app for iOS designed with the social media generation in mind. It combines professionally designed filters that can be applied with a press of a button with in-depth controls that allow you to tweak every aspect of your pictures. Darkroom even supports batch processing, so you can edit, manage, and export multiple pictures at once instead of having to edit pictures one by one. Once you’re finished editing your pictures, you can export them as uncompressed TIFF and PNG files, or save space with 100%, 95%, or 80% compressed JPEGs. In Flip, you skateboard around famous cities across the globe while avoiding obstacles, collecting bonus items, and trying to achieve the highest speed you can. The game has colorful and somewhat trippy graphics, and it uses a real physics engine to make the skateboard experience as close to reality as possible. Flip is one of those deceptively simple games with mechanics that take just a few seconds to learn but hours and hours to master. As such, it’s perfect for when you have a few minutes of time to kill and there’s no more fresh content on Reddit. The web is a complex place with too many interesting things to see, read, watch, and experience. Social media networks help us curate the wealth of content to some degree, but they have their own limitations. Plu.us is like a meta-social network that lets you save, discover, and recommend the best, most interesting links on the web. With a single Plu.us account, you can aggregate all your social links within one app and make it easier for your followers to keep up with you. DC Unchained is an action RPG set in the DC comic universe. Pick your favorite superhero or supervillain and follow an original story inspired by the DC Comics storyline. As you play, you’ll be able to enjoy exclusive artwork illustrated by DC Comics artist Paolo Pantalena and relive some of the most legendary DC battles with your own fingertips, using iconic weapons and abilities. The game is free to download and supported by ads and in-app purchases. Ditch your boring ringtone and replace it with a fresh video ringtone with Vyng! This innovative app allows you to use just about any video as your ringtone. Yes, that means you can pick a different cat video for each person in your contact list. If you don’t have your own videos, Vyng has you covered with several video channels that include hot video ringtones from the community. Fishing Strike may just be the best fishing game on Android and iOS. It has realistic graphics and relies on a physics-based game engine to make the fishing experience very close to reality. The game lets you catch over 500 types of fish using a variety of equipment. As you play the game and your abilities improve, you unlock new equipment and fun challenges to test it on properly. Each fish you collect goes inside your aquarium, and Fishing Strike allows you to use VR headset to get a 360-degree view of fish moving realistically in the aquarium. You can always tell a smartphone addict by a hand-picked wallpaper that’s never more than a couple of days old. If you’re such an addict, and you love to keep your smartphone feeling fresh with original wallpapers, we highly recommend Wall of Fame, a new wallpaper app for Android with a sizable selection of wallpapers for smartphones of all sizes and resolutions. The app doesn’t store any wallpapers on your device, so you’ll need an internet connection to use it. Honkai Impact 3rd is a mobile anime action RPG where players take control of powerful Valkyries to clear various PvE stages through the lengthy story campaign mode. The game places heavy emphases on combat and character customization, but it’s so lore-rich that it’s worth playing for the story alone. According to the game’s developer, Honkai Impact 3rd can take weeks of game-time for players to complete, so you can be sure that it won’t be over before it even starts properly, as so many mobile games tend to do. When learning math, it’s indispensable to have a reliable way how to verify your solution to a problem. If you don’t have someone nearby to help you, Socratic is your next best option. This AI-powered app math combines cutting-edge computer vision technologies with machine learning classifiers to help you solve math equations just by taking a picture of a math question. Best of all, the app can also teach you step-by-step how to solve just about any math problem yourself, so you won’t find yourself in a difficult situation when your smartphone runs out of battery power.